When your nickname is Getrad, there is a certain standard that you have to live up to. Jackson “Getrad” Buhck doesn’t disappoint. His video part in the recent Australian skate video Another Every Other is one of the greatest things to ever happen in skateboarding. Never before have so many incredible things happened on a skateboard in one video part. We’re not talking about incredible in the Brandon Westgate sense. More in the dork tricks sense that all skaters — even Eric Koston — can relate to. This is what makes skateboarding fun. 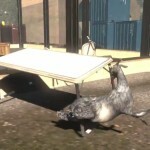 UPDATE: Goat Simulator Available For Pre-Order!